Thanks largely to the ubiquitous access of mobile devices, the total time people spend consuming media continues to grow. According to the head of forecasting at Publicis’ Zenith unit, it will max out around total awake time. “I think we’ve got a way to go,” Jonathan Barnard, Zenith head of forecasting and director of global intelligence, told Media Daily News during a briefing on the eve of the agency’s new Media Consumption Forecast, released today. But with new technologies -- especially 5G connectivity and Internet of Things connected devices -- Barnard predicts the upper limit of media consumption will only be limited by sleep. 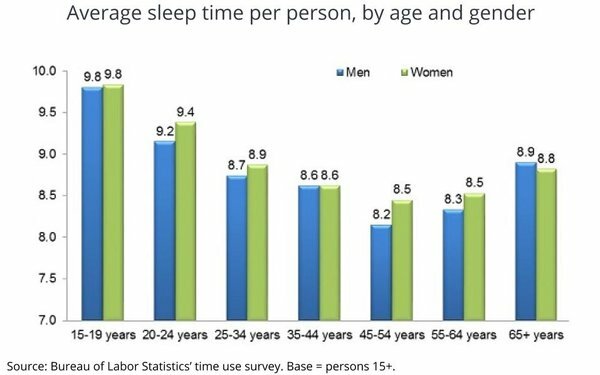 Currently, the average American’s non-sleeping day is about 912 minutes, according to the U.S. Bureau of Labor Statistics. Zenith’s new forecast estimates the average American will spend 636.6 minutes daily with media this year, or about 70% of the time we are awake. 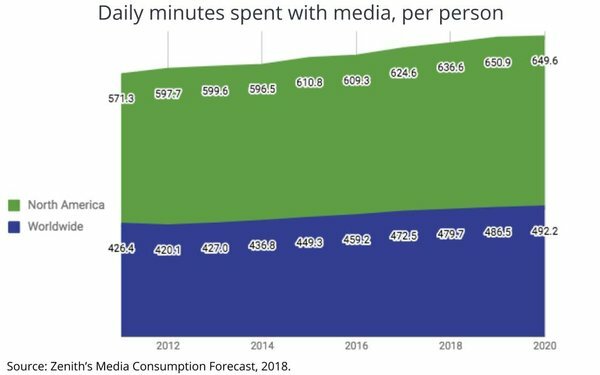 Over the next two years, Barnard forecasts we will add another 13 minutes per day consuming media. The U.S. indexes among the highest nations in the world in terms of time spent consuming media, but Barnard says the global average is catching up. That's due to more ubiquitous access via mobile technology, and ultimately, from IoT connected devices too. 10 comments about "Get Woke: Time Spent With Media Approaching Total Awake Time". Ed Papazian from Media Dynamics Inc, May 29, 2018 at 9:49 a.m.
Joe, we can't accept the device usage stats, which are what these findings are based on for TV , radio and digital, at anything approaching face value. Deduct 10-15% of the media usage time as representing device on---but no one even present. Delete lack of attention and you get barely six hours per day where the "audience" is reasonably "attentive". For example, eyes-on-screen studies show average second levels of around 40-50% and sometimes lower. I'm sure that digital media's eyes looking elsewhere rates are also of this magnitude. Joe Mandese from MediaPost, May 29, 2018 at 10:13 a.m.
@Ed Papazian: You don' have to accept them, but they are Zenith's estimates. I'm going to guess that they, their operating units, and their clients, also factor some kind of net on gross in terms of cognition, attention, etc., but those are their gross minutes of time spent accessing media. Joe Mandese from MediaPost, May 29, 2018 at 10:15 a.m.
@Ed Papazian: By the way, it's quite possible that future generations of media exposure -- the kind powered by IoT, AI, etc. -- may not even cognizant to consumers, but it doesn't mean they won't be influencing them. Ed Papazian from Media Dynamics Inc, May 29, 2018 at 10:31 a.m.
Joe, based on the numbers cited, Zenith did not do any adjusting downward to reflect involvement or similar metrics. They seem to have taken published Nielsen numbers which are assumed to represent personal consumption---but don't, actually----and used them. I don't want to get into the whole business of the inherent overstatements in these "audience" studies, here, but readers who subscribe to our annual, "Intermedia Dimensions 2018", can see exactly what I'm talking about in our reviews of time spent, audience attentiveness, etc. Joshua Chasin from comScore, May 29, 2018 at 11 a.m.
Don't be surprised to see total media time exceed total wake time-- unless someone is deduplicating to account for simultaneous usage. Ed Papazian from Media Dynamics Inc, May 29, 2018 at 12:28 p.m.
Good point, Josh. That's another 10% or so that should be deducted from the gross "raw" totals. Jack Wakshlag from Media Strategy, Research & Analytics replied, May 29, 2018 at 2:28 p.m.
Was just going to say that. Agree 100%. Would be good to know if simultaneous usage is factored in Zenith's figures. John Grono from GAP Research replied, May 29, 2018 at 6:32 p.m.
You beat me to it Josh. Do you recall a similar article a few years back which had media consumotion at 28 hours per day and climbing! All claimed usage, not de-duplicated etc. etc. - all the usual errors. Ed Papazian from Media Dynamics Inc, May 29, 2018 at 7:05 p.m.
Maybe they are counting those 5000 ads and commercials that the average person is "bombarded" with each day, John. Figure five seconds "viewing or hearing per ad and that works out to more than four hours per day just consuming advertising. Ed Papazian from Media Dynamics Inc, June 1, 2018 at 11 a.m. Correction on my last comment. I started out with three seconds spent per ad---which yields the figure I posted of 4+ hours per day spent with ads. Actually, I changed the text to five secs per ad but forgot to redo the math. It works out to over 7 hours per day spent with ads---an even more absurd figure.